As eye care professionals, you know the value and importance of eye exams and clear vision. However, for many of our patients who lack basic shelter or food, eye care is not only out of reach, it is out of consideration. KCFEC brings eye care professionals together with the patients who need their care the most. The clinic is open on Saturdays and Sundays, late morning to early afternoon. Exact times are flexible around your availability. Eye care professionals can volunteer as frequently as they choose. Volunteering just once a quarter allows us see 60 patients! 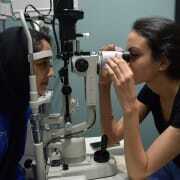 Optometrists and Ophthalmologists conduct comprehensive dilated eye exams. Many of our patients have not had an eye exam in over 5 years, if ever. Opticians help patients chose frames from our selection of donated eyewear. Patients loving being able to choose their own glasses and feel confident in their new look.